Nobody wants a rat’s nest of wires in their shop. With every power tool you own having its own power cord, it’s easy for the cords to become a huge mess, tangled onto each other. Contributing Editor AJ Moses has tried a bunch of different cord wraps, looking for the best solution for this problem. Here are his top ideas. This falls into the category of pay me now, or pay me later. It takes a little bit of time to put cord wraps on your tools when you’re done using them, but you’ll love the positive benefits. When you retrieve your tools you’ll be able to simply pick the tool up, without fighting against the cord braid that seems to develop when one power tool is sitting next to another one. Depending on where you store your tools it’s also possible that you’ll reduce trip hazards by managing the cords, instead of allowing them to run wild. Looking for more ideas on shop improvement? 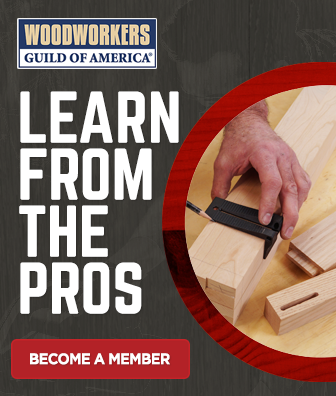 WoodWorkers Guild of America has some great shop improvement ideas you can take advantage of. 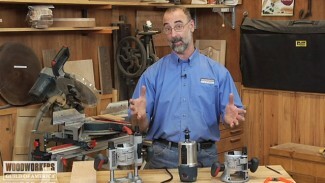 If you lean toward power tool woodworking, check out the broad array of tips and tricks we have available for you. From belt sanders to routers to table saws to bandsaws (and more) we’ve got a boatload of power tool woodworking ideas for you. I use caribabiners to contain my power cords, microphone cables, and speaker cables. I can then hang them from a large “L” hook. Where did he find the Memory Cords? My favorite cord keeper is the Velcro cable ties. For example Model # 90438ACS at Home Depot. These attach to the cord itself, so there is no chance of losing them. They are easy to untie, easy to tie back and they hold great. I tried using the cable clamps shown in the video, but they seem to get in the way, and the hard plastic just feels like it will break if I throw stuff around like I normally do. You can get different lengths of these velcro ties. Work great, you can drag them around on the floor on the cord when working, and I never lose them. I also use the velcro wraps… I use them for most all of my tools, as well as the Christmas lights.. Makes for an easy way to take care of them, as well as making the process of putting up the lights a LOT easier.. no tangled light strings.. I find the velcro “wraps” work best because you can attach them to the cord or hose and they are always there, not like the two other types that are lying on the far side of the house when you want to wrap the hose. They also come in bright colors. Check the internet/ebay for best pricing on large quantities and sizes. I use pieces of # 14awg electrical wire. I usually get scrap of Romeo 14/2 which is solid wire. I cut them to length I need and loop them around the cord so they stay in place. Easy and handy to use. You don’t have to worry about losing them as they are always attached.